- Physical damages to the phone that goes beyond repair. Therefore, info on the phone cannot be accessed again. All of which are reasons why SMS will need to be backed up and restored to the Android phone. Actually we have two different solutions to help you do the SMS backup and restore process. People usually insert an SD card into their Android phones for storing large files, such as photos, videos and music files. You can manage files on SD card. In fact, you can also export text messages and photo messages to this SD card and insert it to your new Android phone in turns. 4) Now, you can insert the SD card to your new phone and view those text messages on the new phone. Note: The solution above only works on the Android operating systems that allows for message import/export. If your Android OS doesn't allow that, you will have to use an additional app for help. MobiKin Assistant for Android or Assistant for Android (Mac Version) enables you to transfer text messages from Android to computer, and import text messages from computer into your Android phone. In addition to SMS messages, this program also allows you to transfer contacts, photos, videos, music, apps and more other files from Android to PC or Mac, and vice versa. Now you can follow the steps to download the program on your PC or Mac by clicking the buttons below. Launch its interface and then connect your Android phone to the computer via a USB cable. 1. After Android SMS Backup & Restore tool detects your connected Android phone, it will show the phone in the interface. 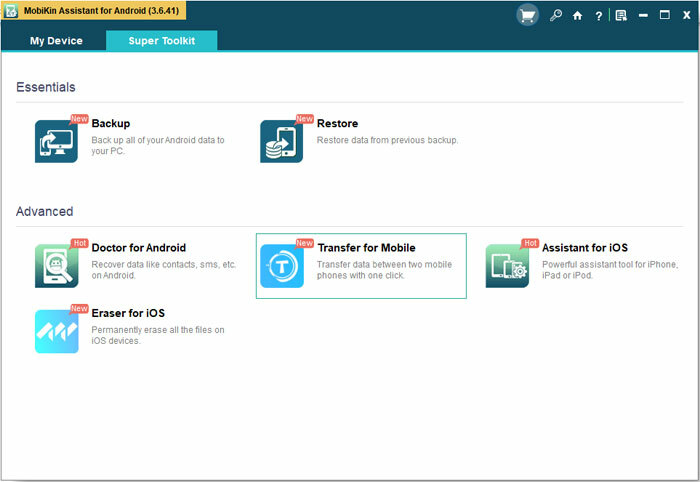 Choose the "Super Toolkit" option from the top menu to enter the 1-click backup & restore screen. 2. Click the "Backup" tab to bring out a new window that shows all the file types you can backup. Select the Messages category, click Browse to choose an output location and click "Back Up" button to save the text messages to your computer. The backed up Android text messages will be located on your computer. 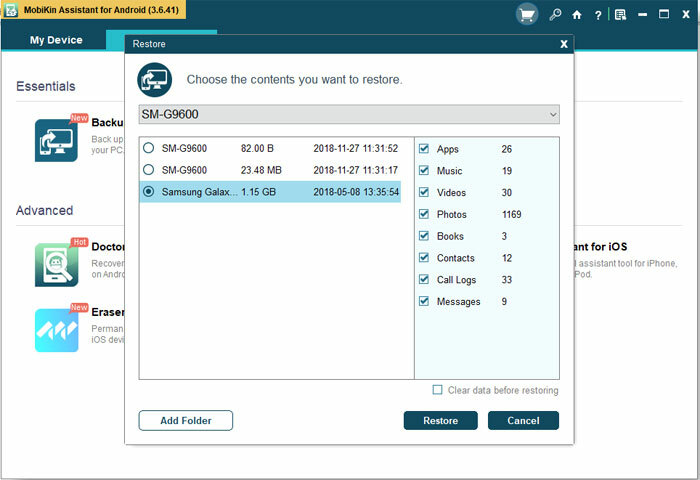 Next time if you want to restore those backed up SMS back to your phone, you can also use this Android SMS backup & restore tool to transfer them to your phone by enterring the Super Toolkit window, clicking the Restore tab and choose the Messages category to restore to your Android device. 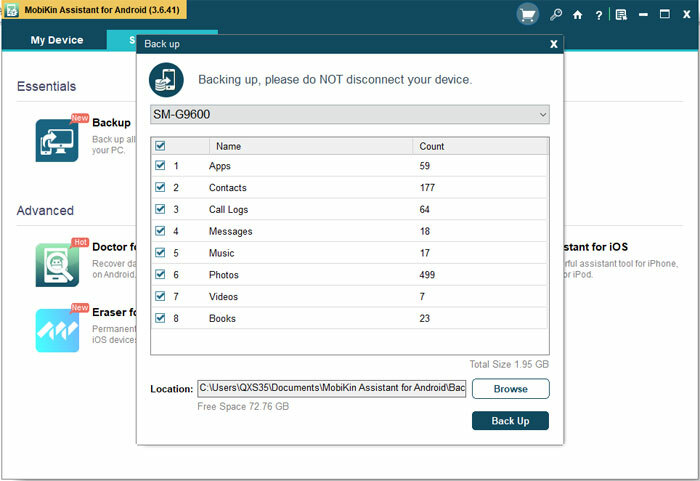 With Android Backup Restore software, you can backup and restore text messages from or to any Android phones with one-click. It is also feasible to download and install some high-rated applications on your phone to complete the Android SMS backup and recovery. And this would be easy since there are lots of great applications on the market for you to select. And here, to help you pick up the suitable one more quickly, we would like to show you several great SMS backup and restore software for Android. SMS Backup & Restore gets a good mark- 4.5 in Google Play. This is a flexible application to backup and restore your Android text messages and MIMS that is multimedia messages. It enables you to backup the messages on your Android phone automatically or manually. And after that, you can easily restore the conversations that you have backed up. With it, you can switch the messages from one phone to another without any hassle. Most of you may know the software SMS Backup+. This application helps you to make a SMS backup easier- you can use it to backup SMS, call log details, MMS and restore them when you lose them. Here, what is worth mentioning is that the usage of this program is very straightforward. This is also the reason why many users select it. Differ from the two applications above, this advanced tool allows you to backup and restore more than text messages. That is to say, you can use it to backup more files like your user data, system settings, .apk files and also data stored in your system. With it, you won't need to worry about the data loss anymore. What's more, it also features other great funtions. It is able to merge duplicate contacts, batch delete backups, merge individual backups and cloud backup through cloud services including Dropbox and Google Drive.